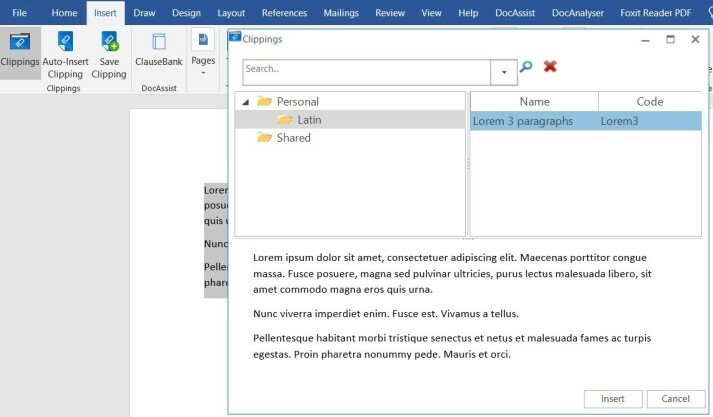 Clippings enables users to save pieces of text, tables, images or anything they might have on a document (a clipping or clause) for reuse in other documents. Clippings can include automation and can be used on Word documents as well as emails. 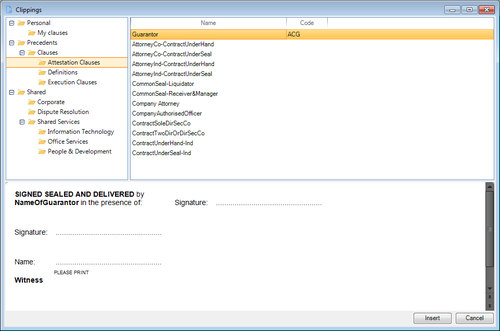 A business can specify up to 3 different locations to store clauses with 3 different security policies applied; making Clippings a flexible option for firms where users prefer to use their own versions of clippings rather than being limited to the selection provided by an administrator. Users can also edit a Clipping on their document once it’s been applied. It is the perfect solution to enable users to build documents incrementally using their own saved or shared content. How do I insert a Clipping? Click the Clippings button on Insert menu in Microsoft Word to display the Clippings dialog. Browse the selection of Clippings available, making use of the Preview screen to ensure you’ve found the one you’re after. Click Insert. Simple! How do I save a new Clipping? So you’ve written an amazing paragraph and you’d like to store it for future use. Well, very smart of you! Simply highlight this spectacular paragraph, click the Save Clipping button on the Insert menu to display the Save Clipping dialog. Give your fabulous Clipping a name and optionally a code, and voila! Try a free fully functional edition of Clippings to see if it’s a fit for you. Get in touch and we’ll make it happen.